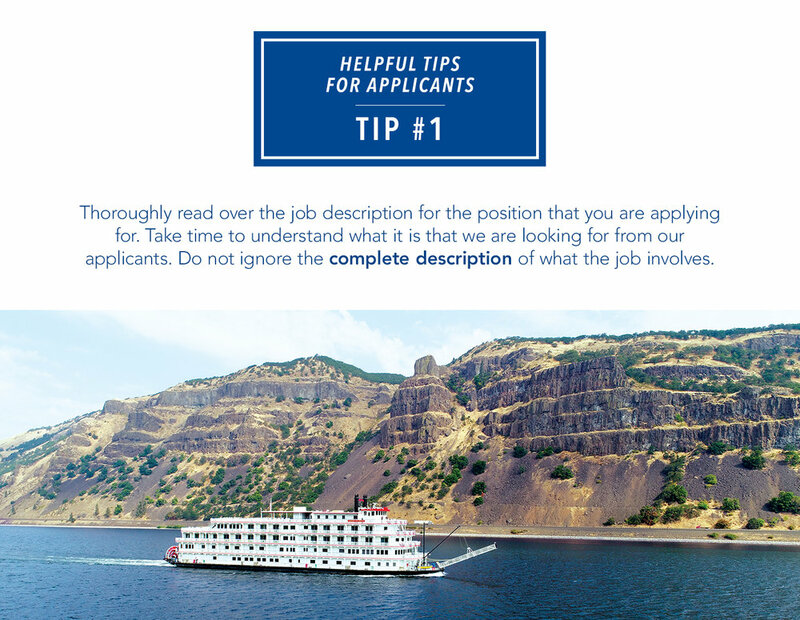 This section was designed to answer some of the frequently asked questions concerning employment with American Cruise Lines. View the questions below to find an answer. If you do not find the answer you are looking for below or if you need more details, please do not hesitate to contact us at careers@americancruiselines.com. To apply for any of our positions, applicants must fill out an application through our iCIMS system. After selecting the position of interest that is best suited for your experience and background, you will need to fill out the application to its entirety. Please note that at the time of your application you must be able to provide your resume as an attachment. What if I require Visa sponsorship? Per U.S. Coast Guard regulation, you must be a U.S. citizen or Green Card holder to work with American Cruise Lines. Shipboard Managers and Temporary employee interviews are conducted via Skype. If your qualifications match our current hiring needs for the position you applied for, one of our recruiters will reach out to you directly via email. It is important to stay on top of your emails that you receive from us as they are time sensitive and will be the way for you to move forward in our process. For the Skype interview be well prepared to speak on behalf of your background and skills. What is the duration of the shipboard positions? Servers, housekeepers, deckhands, and dishwashers can work for us up to 28 weeks. Managers and officers work a schedule of several weeks on, several weeks off, with longer shifts shipboard during the busy season (summer and fall). After accepting the job offer we will work with you to create your schedule and organize travelling to our ship. Once you have completed your time with us, we work with you directly to coordinate your travel arrangements to get you back safely. Checking the status of your application can be done at any point in time once you submit your application. Go to your iCIMS profile using the credentials that you made when first applying and go to your dashboard. 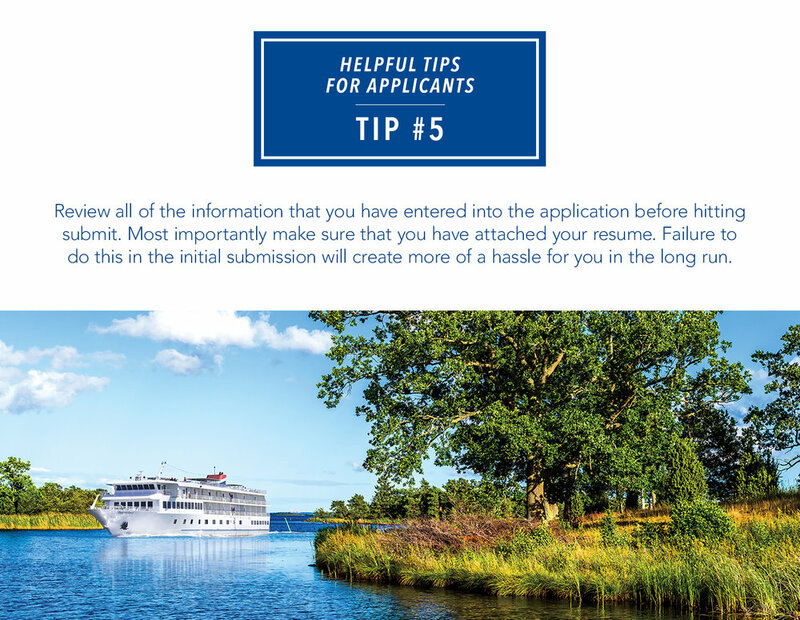 Here you will be able to view the current status of all applications that you have submitted to American Cruise Lines. Where are the company's offices located? Our offices are located in Guilford, CT and Sandy, UT. Our ships travel throughout the East Coast, West Coast, Mississippi River, and Alaska. American Cruise Lines' modern ships are a testament to premier nautical engineering, luxurious comfort, and river cruising convenience. Our fleet of modern riverboats, paddlewheelers, and small cruise ships offer the latest amenities, state-of-the-art navigation, and safety equipment. How long is training and what does it involve? The length of training varies by position. At training, you will learn everything that is needed to prepare you for your time on board with us. Our training program is taught by our skilled Hotel Operations Trainers. 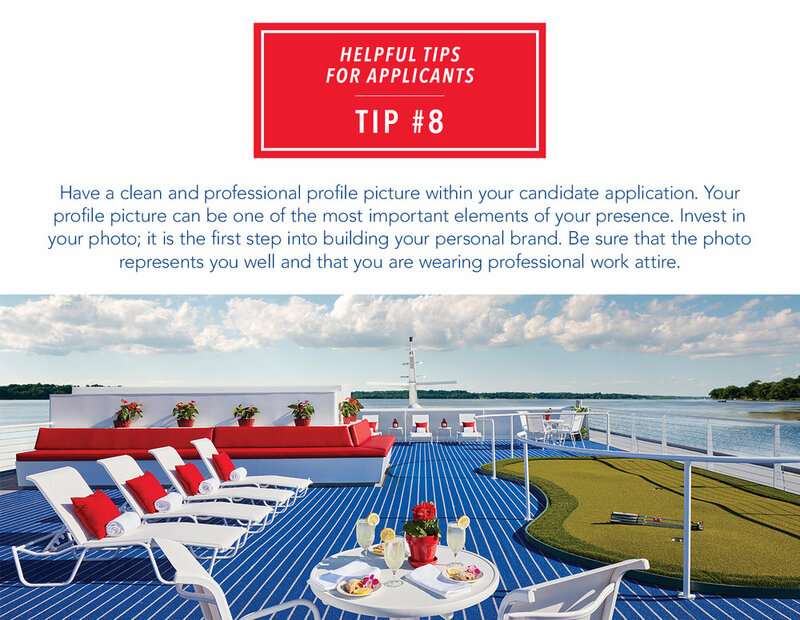 Learn more about how to prepare for an interview with American Cruise Lines. Use the arrows below to navigate through the 9 tips provided.